From our home we can never see a great sunset. Too many houses and roofs around us. 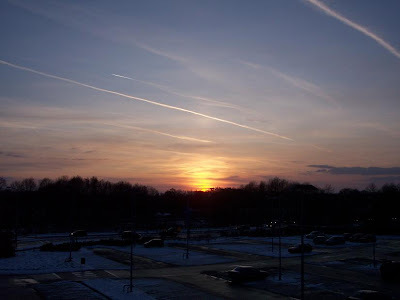 A few days ago I tried to catch a sunset from the parking deck in a shopping mall. Not spectaculair but at least I had some pictures. And I got a bonus too. The top photo with the contrails is nice. And getting birds in flight is always a bonus to be proud of! Those are beautiful captures. Love all your photos. Beautiful shots. I loved the second shot most. Allebei mooie foto's. Het is altijd weer leuk om een mooie lucht te zien hè. Gauw camera pakken en schieten. Amazing bird formation, what kind of birds are they? You might call it not spectacular, but I think they're both great. I specially love the contraisl in the first photo. @Bill, they are geese. During the winter they have been flying between their night shelter and daytime feeding place I think. 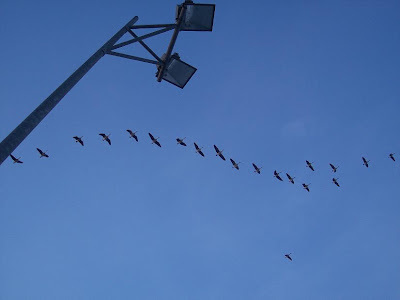 Every day around half past 9 they flew to the south and around half past 4 they flew back to the north. There were many of them but I always was late with my camera. Now that days are lengthening they are earlier in the morning and later in the afternoon. I wonder if they are only staying for winter or if they really 'live' here. Very nice and I know what you mean, I have to drive to get the sunset too! Thanks for stopping by and commenting, have a great weekend. Lot of birds and airplanes flying in the sky above you there. Are these birds coming or going? Beautiful formation and great photo - even in the animal kingdom, there have to be laws and order - can't fly willy nilly where you feel like it. I love the flying geese. Beautiful pictures. Ook hier moet er iets is gegaan zijn ... Blogroll is dus niet te vertrouwen. Ik vind je zonsondergang zeker spectaculair en de ganzen zijn altijd een mooi gezicht en geluid!